Which industry sectors could gain significantly from a drive for energy efficiency? What are some books that you recommend on the energy industry? In this episode I will discuss the industry that I believe is most susceptible to being damaged by high oil prices, and I will go through the stack of books behind me in the video. Excellent show! It added a lot to see some reference materials displayed. Maybe in the future if you run short of questions and answers to talk about you can discuss some specific chapters to generate additional comments. Here is some more reading material that I think makes far more sense in terms of giving any technology the opportunity to meet mandates (e.g., like methanol) rather than what the federal government does in picking winnners (e.g., ethanol only). The new final draft was issued today. Here is one part that opens the standard to all technologies and fuels. As a starting point, staff’s evaluation of the illustrative scenarios developed for this report suggests that there are numerous scenarios that can be employed by stakeholders to comply with the program.10 Because the LCFS is non-prescriptive relative to the type of fuels used, regulated parties could choose to comply with LCFS targets through any number of technologies. Therefore, these scenarios only attempt to identify some possible paths, but do not attempt to predict actual compliance methods. Staff looked at sixteen illustrative scenarios during the current review – eleven gasoline and five diesel scenarios – based on various assumptions about fuel producer responses to the compliance schedules. For example, some gasoline scenarios were based on lowered cellulosic ethanol projections, increasing numbers of flexible-fueled vehicles, and assumptions about “drop-in” renewable gasoline. The LCFS applies, either on a compulsory or opt-in basis, to all fuels used for transportation in California. These transportation fuels include California reformulated gasoline, California ultra-low-sulfur diesel fuel, E85, compressed or liquefied natural gas, biogas, electricity, and compressed or liquefied hydrogen. It appears ethanol would be the only option for transport fuels, which eliminates converting methane-to-methanol. Walt, I had a look at that report, the section from p65 on the different fuel types interesting. It even mentions butanol, algal fuels, renewable diesel, renewable gasoline. In fact it mentions everything BUT methanol, and the methanol derived DME. It is almost as of there ws a concerted effort by the members – which included representatives from almost every alt fuel except methanol – to specifically exclude methanol. My theory is that sonce methanol is actually the best drop in alternative available, is the the greatest threat to the nicely feathered nets of all these alts, so it is inall of thir best interests to ensure methanol is regulated out of the fuels discussion, so that their own lesser fuels all have achance. And why was there no representation from the methanol institute on this board? Given the huge run up in shale gas production, and the low gas prices, the single best thing the gas industry could do to make themselves desired, rather than despised, is to start making methanol for vehicle fuel, because then their product is going into the fuel tank of every single driver in America. Then, there is truly a reason to encourage this industry – with appropriate environmental controls, of course. Methanol can set America free – when will they wake up to this fact? I heard back minutes ago from my contact at LCFS and they confirm your point. Nobody from the methanol industry applied for use of the fuel in transportation. It makes me wonder about the fact that this is because of the EPA federal limit of 3% max. blended in gasoline. Again, we can look at the federal government and the lobby efforts to remove methanol from the gasoline pool. If we could get them to allow methanol blended gasoline above 3% it would knock out ethanol and it would make a lot of unhappy corn farmers…as I don’t believe they will compete with the large volume of methanol that would be imported into America. You can be blenders would buy cheap methanol, rather than expensive ethanol, and put it into gasoline. Those volumes could come from offshore since we don’t have the domestic production. From the email I just received, the door is open, but I will need to get ready with some political heavyweights from the Obama Administration to get an application approved. I imagine the outside influence will be fierce unless we can hire a large number of powerful lobbiest to counter the attack the application will face. After watching the 60 minutes special on Washington, DC lobby bribes, it is now clear there is just no way to get anything done except for bought and paid for (in hard cash and promises for high paying jobs) political influence. The system is broken! I have hope things will change…and will keep fighting for change. Change we can believe in! How is this for a perfect example to set the standard for the algae industry…here is how it works…right out in the open. agreement with the Department of Energy’s Idaho National Laboratory (INL). helping to enable DOE’s Bio-energy Program. past several years for the National Science Foundation. How many other algae companies could have got inside INL to be able to help set the standard for algae oil? I respect his technical abilities and his political connections, but in 9 months to take the role as CTO and then land the DOE contract is fast. the point where we need to focus on fast-track commercialization. To support this new focus, veteran technology executive Paul Reep has accepted the position of Senior Vice President of Technology, as well as a seat on OriginOil’s Board of Directors. his most recent assignment at the University of Southern California’s Stevens Institute for Innovation, Mr. Reep managed as many as 200 technology cases at one time. For example the last book you talked about which you agreed to disagree with, LOL. What was his vision vs your reality. He is very prone to citing very optimistic studies and then projecting that this is the future we can have — we just have to do it. For instance, in his 2005 book he is talking about cellulosic ethanol for less than $1/gallon. I think we can all agree that in hindsight this looks silly, but he does that all the time. Overly-optimistic projections become the future, and those pesky technical details are ignored. In a nutshell, his vision is cleaner, greener, abundant and much cheaper. My vision is that you won’t have all four. Cheaper and abundant will be in short supply, and as a result we are likely to see a lot of dirty habits. We don;t want our discussion to distract from the start of RR’s televison career! BTW, RR, thanks for the list of books – it seems to me the number of oil books that come out at any time roughly follows the oil price! I think I will try to get hold of that one on the Forest Industry. 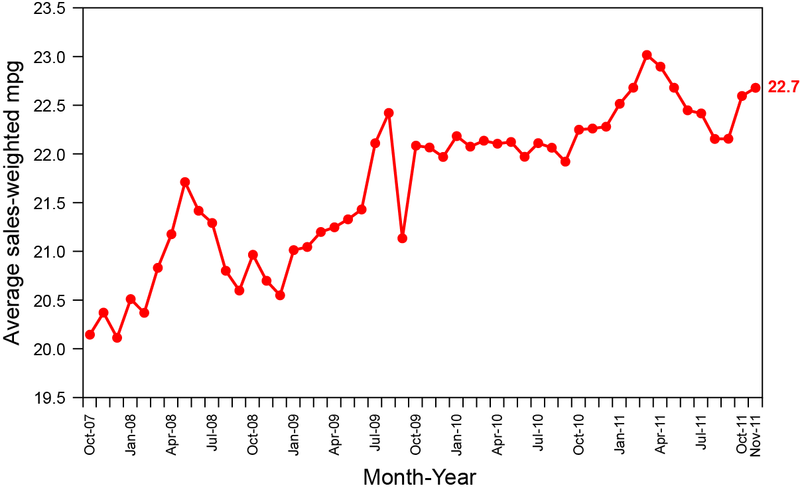 The MPG Efficiency of purchased vehicles has increased 12.3% since Oct. 2007. Meanwhile, Ethanol has gone from a couple of percent of gasoline supply to a little over 11%. Now, it looks like mass produced “carbon-fiber” materials might be on their way. Paul, I am not able to post on that link. Maybe there is a setting that will allow for posting that was not turned? Has anyone else noticed how mellow this blog has become since RR put Kit P. in the penalty box? A liter of NH3 carries more hydrogen than a liter of hydrogen. Almost every farm in the Midwest (no doubt even in Tunica County and the rest of the Deep South) already has an ammonia tank and the support of an ammonia infrastructure distribution system. Walt – it works if you are logged in – it’s about time you registered anyway. Otherwise I don’t know – maybe Sam or RR can answer that? But I can;t agree on ammonia fuel cells – you are talking for transportation, right? That would be trouble waiting to happen. I am not able to see the “quote and reply” button in that thread. I have decided not to register some time ago after RR removed my methanol video from his article after our controversy. The last year we have learned a great deal by really digging into some of these DOE grant applications to see how people were funded, and especially how the system works for IPOs. I’ve had one of my employees working almost exclusively on looking at how the financial markets bring these companies public, and which hedge funds are involved. When I saw the 60 minutes special on how almost every congressman and senator are engaged in buying stocks (since they are exempt from insider trading rules) of companies that will benefit from their legislation, and some get exclusive access to these IPOs, it helped put things in focus for us. When the author of the World Bank study was completed and our technology was rated #1 out of these evaluated, the author made it clear methanol is not the “flavor of the month” for those who put the deal flow in front of these legislators. It goes back to the fact that technology does not matter to the markets. A couple blind hedge funds, or blind trusts as used by legislators, can crush a technology company now matter how great it is, or visa versa. Here is the 60 Minutes video on congressional insider trading. You can see why many VC’s focus all their investments into companies that have congressional legislation supporting the technologies of choice. The important thing for the hedge funds and blind trusts are to use high frequency trading among several to insure timing. Until the core of the system is changed, which will not happen in my lifetime in my opinion, we will keep studying these market factors that have so far made it difficult for methanol to break through into fuels in America. I still believe that like Exxon, Chesapeake and Celanese have done with their gasoline and ethanol technologies, don’t mention methanol as the intermediate. Calling it gas-to-gasoline or gas-to-ethanol (without food feedstocks) is becoming a lot more interesting worldwide. Bottomline…until we can figure out the financial sector and funding strategy in these markets, we are just spinning our wheels. Funding $2-20 million dollar projects is not possible as a small business, and unfortunately my Amex limit does not go that high! Walt, if you have an unresolveable problem with RR, then why post here at all? If you are going to post – which obviously I like that you do, then you might as well register so you can use the site fully. I wonder what Washington, Frankiln, Jefferson, Roosevelt etc would think of these shenanigans by todays congresscritters? They were just as bad, if not worse. Maybe today politicos are just angry as none of them have their pictures on any money! Considering the shape of “today’s” money, it seems like that would be a relief. I missed the military “‘industry” in your sector inventory ? here some marketingmachine is constantly buzzing and spinning, seems the holy grail for alternative energyproducers to get involved in dod projects…. I think this congress is far worse than at any time in history, especailly compared to those prior to 1865 and the establishment of military courts across the southern states to try civilians during times of war. The first executive order started the slipper slope of these shenanigans until now. It’s amazing that Amory and I can agree so much on what the problem is and disagree so vehemently on how this is all going to play out. He promoted hydrogen as a transportation fuel for many years, giving it his characteristic spirited defense. After having read the many critiques of using hydrogen in that way, I began to lose confidence in his opinions on complex engineering issues. It was so obvious that this idea was infeasible I was amazed that he had spent so much time and energy promoting it. His Hypercar concept was little more than the use of composites to build an aerodynamically clean, lightweight SUV. Nothing new at all. An actual car was never produced. Manufacturers don’t use composites or do a lot of wind tunnel testing for economic reasons, not because they’ve never heard of such concepts. His attempts to promote/produce this car struck me as naive from an engineering/manufacturing perspective. I have a few hypothesis as to why his betting record is so dismal, not to mention how he manages to get his name connected with ideas that are not novel in the first place. First and foremost, he is not trained as a scientist or engineer. Secondly, he has little experience with actual real world engineering. It takes decades to become a good engineer. But that certainly can’t explain it all. He had a great reputation among environmentalists until the internet arrived and began exposing the weaknesses in his arguments. In short, he is not particularly technologically astute, or apparently very adapt at critical thinking. Most recently he has been attacking nuclear energy on cost grounds. As usual, this isn’t a novel idea, and as usual, it’s as full of holes as the rest of his arguments, long-winded and detailed as they always are. His reliability took another hit with me when he passed along an untrue urban legend about the impacts of radiation from Chernobyl in one of his nuclear cost articles (although he was called out for that in the comments field). As the EU / Euro is getting ready to collapse with governments now preparing themselves, this is really bad timing…but is indicitive of bankers and political leaders working together as the famous untouchables! Austrian National Bank (OeNB), including its Governor, Ewald Nowotny (Handelsblatt). I missed the military “‘industry” in your sector inventory ? Art, you are correct that military would benefit immensely from efficiency gains. But I was thinking more along the lines of private industry and investments. Looks like we need the military-industrial complex to save us from the stupidity of Congress (Could it really be that the much maligned military-industrial complex is more ethical and honest than Congress? I’m beginning to think it is). See reports on the Green Strike Force. Notice the phrase “Biofuel from Non-Food Sources”. It is one Congress can’t figure out. Or “drop-in replacement”. BTW, RR seems that Tyson Foods found a way to move forward with the project without involving COP. That’s a pity. COP knows a lot about making fuels that Dynamic Fuels will now have to re-learn.